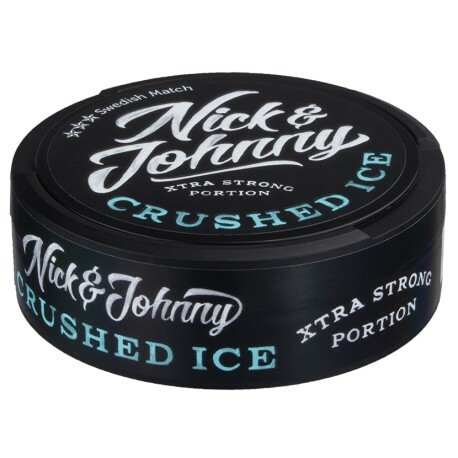 Think of Nick and Johnny Original snus sleeping around with General Large Mint snus with the nicotine hit of General Ekstra Sterk and you get Nick & Johnny Crushed Ice Xtra Strong Portion Snus. Swedish Match describes Nick & Johnny Crushed Ice Xtra Strong Portion Snus as "a Snus with a medium-bodied tobacco character with clear hints of fresh mint, and with well-rounded sweetness." I think our description is much better than the lame description from Swedish Match. Nick & Johnny Crushed Ice Xtra Strong Portion Snus also has an excellent nic hit too! Reminds me a lot of General mint but the flavor doesn’t last as long. Nice big pouch though that I don’t bite through as easily as I do with General. Certainly not extra strong though. General Mint is a solid snus. That said, I was stunned by the flavor profile of this Nick & Johnny's Crushed Ice and found it to be even better tuned to my tastes. The variety of Mint flavors in this one make it even more refreshing to me and the strength is very nice after a meal. I will definitely be keeping a healthy stack of these tins in my rotation and look forward to seeing a sleeve in my fridge at any given time. This is a very good snus for anyone who likes a little mint but not an overwhelming mint flavor.This snus is full of rich tobacvo flavor with a hint of mint very well ballanced flavor profile.Some mint snuses are so strong you cant tell theres tobacco flavor at all, This is like general mint with less mint and a hint of its own original flavor. Ill keep this in my daily rotation for as long as they produce it.